Rotoform® system for handling of an exceptionally wide range of resins including high viscosity products (from 10-40,000 mPas), products with high feed temperatures (up to 300°C), and those sensitive resins that require particular care in terms of temperature profiles achieved with zone cooling. As a company whose relationship with the chemical industry extends back to first half of the last century, we are able to offer unparalleled experience in the cooling and solidification of melt products in general, and resins in particular. These include our flagship Rotoform® system, capable of handling an exceptionally wide range of resins including high viscosity products (from 10-40,000 mPas), products with high feed temperatures (up to 300°C), and those sensitive resins that require particular care in terms of temperature profiles achieved with zone cooling. And, most recently, we have introduced our ThermoCut® system, overcoming the problem of “angel hair” on high viscosity melts. We offer a range of feeding devices to process resins with very different viscosities. All are designed to ensure that contact between the product and atmospheric oxygen is minimal and that no air bubbles are added, guaranteeing that there is no degradation of the resin in the feeding device. The molten resin is deposited on the steel belt as a single layer in a predefined, controllable thickness. Belt cooling removes the heat and the resin layer solidifies. At the end of the steel belt the solidified resin layer is discharged and reduced to flakes by means of a breaker. The breaker is individually designed according to resin type, the flake size required and the capacity of the plant. This solidification system is based on our proven steel belt cooler, a versatile system that can be adapted to meet specific process requirements such as product thickness, temperature profile or processing times. The molten product is delivered onto the steel belt via feed device, forming a film that is taken up by the running steel belt. Retaining strips of Neoprene or rubber prevent the product from spilling over the edge of the steel belt. 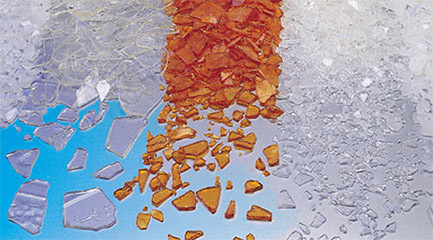 At the cooler end, a crusher breaks the solid product layer into small irregular flakes. The breaker is individually designed according to product type, the flake size required and the capacity of the plant. After leaving the crusher, the flakes are fed into a chute for further processing. For high capacity operations, or where floor space is limited, we also offer a double belt system in which the product is cooled from above as well as from below. In many installations, this type of system provides significant commercial advantage. Furthermore, as some types of waxes and resins tend to curl away from a single belt unit, resulting in irregular cooling and loss of capacity, the double belt system can be used to handle these products more efficiently. It is also possible to cool thicker products to a uniform temperature over the whole cross section. The double belt system also helps to reduce vapours and fumes and to keep them from the operating area. 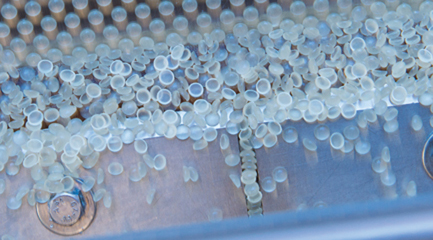 Our Rotoform system has proved itself over many years to be the ideal process for the granulation of resin products, delivering a superior quality end product regardless of the properties of the material being processed.